Overall view of "Three Clouds In Waiting." 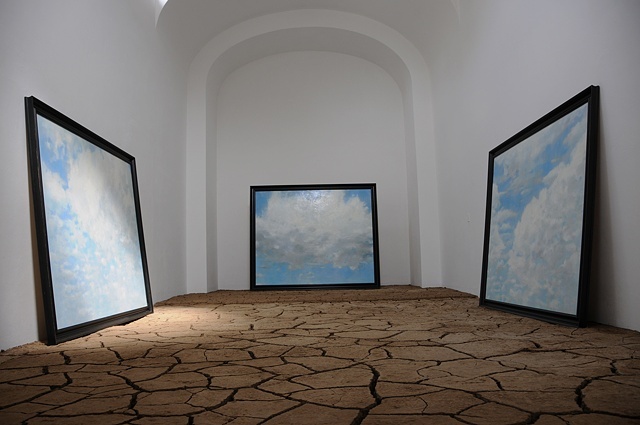 This installation is comprised of three large scale framed encaustic paintings of clouds which rest on a dried cracked Earth floor made from a 6" thick poured slab of mud. Viewers were encouraged to walk upon the floor and touch the paintings in this previous prayer chapel in a retired convent. This site was part of The Luminary Center for the Arts in St. Louis, Missouri.